For any PC racing enthusiast that's ever craved a high-end steering wheel setup but lacked the money / motivation / room to set one up, SteelSeries' Simraceway SRW-S1 Steering Wheel is the answer to all of your problems, and the cause of a couple new ones. Traditional PC steering wheel setups require, at the very least, the edge of your computer desk to lock the wheel on. Players craving a more complete racing experience often add bulky pedals, which take up even more room. The truly obsessed toss in a genuine racing seat. Some of them rumble. All of them are pretty huge. Then there's the question of where to store the bits when you aren't racing — as hard as I've tried, a steering wheel isn't a proper tool for surfing the web or writing blog posts. 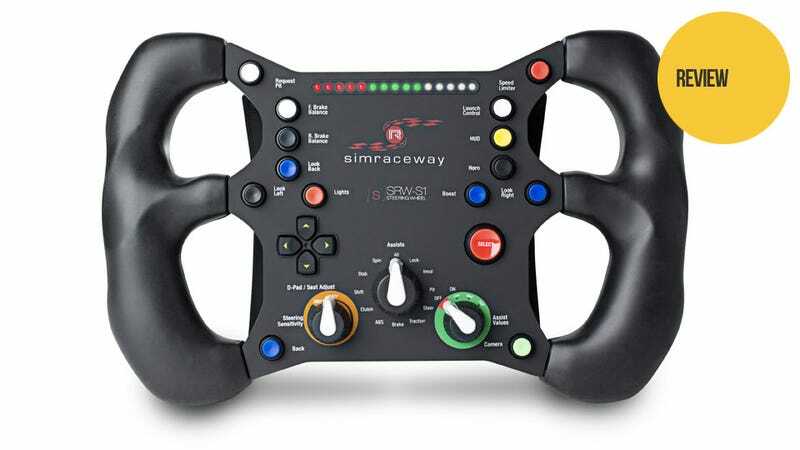 The SRW-S1 racing wheel only requires two hands, preferably with all fingers intact. I didn't test it with one or more of my fingers missing, due to logic constraints. The SRW-S1 uses motion-sensing technology to determine which way you turn the wheel while holding it in front of you like some sort of prop-based pantomime of driving. Braking, shifting, and acceleration are handled by four paddles located on the back of the unit, providing precise fingertip control. Those pedals and a couple of buttons are all you need for most racing games. Need for Speed: Hot Pursuit, DiRT 2, and Blur all performed admirably with the SRW-S1, reacting responsively to my slightest movements. I crashed a great deal, but that's just my way of driving, and no fault of the controller. Windows recognizes the unit as a standard racing wheel, so just about any game that will accept that sort of thing should be supported. So why all the extra buttons? SteelSeries and Ignite Technologies worked together with a team of champion drivers to create the perfect controller for Simraceway, an online free-to-play racing game featuring real-world tracks and real-life racing pros to compete against. Folks that care about terms like 'over-steer' and 'under-steer' will find the SRW-S1 well-suited to their customization needs, adapting the wheel to their own driving preferences. At least I assume they will. Honestly it's all Greek to me. Changing the settings made the cars handle differently, that's all I know. Hey look, it's got dials. Dials. I have no idea what to do with dials. I'm sure someone does. It's a lovely little device, even if you don't understand why it needs so many controls. It's comfortable in the hands, easy to use, and responsive when responsiveness is called for. Whether or not you should spend $120 on SteelSeries' wheel or go for a more expensive traditional racing rig is a matter of tactile feedback. Bulky and expensive as they may be, standard racing controllers, even those without force feedback, at least give you the feeling of being anchored to a mighty metal machine. A free-floating motion-control steering wheel just can't capture the true spirit of driving. It's man versus asphalt, not man versus his arms getting tired. The Simraceway folks know this. They've even got a Facebook gallery where fans can post pictures of the custom mounts they've concocted for the unit. It makes one wonder when an official mounted version might be coming out. Even in the open air the SRW-S1 is a fine PC steering wheel controller, small enough to fit in a desk drawer while responsive enough to compete with the more expensive mounted units. It's got the power, it just doesn't quite have the touch. Perhaps a "once more with feeling" is in order.